Hello. Yes, this is Wayne Tustin. Sometimes I’m called “Mr. Random Vibration,” about which I’ll teach in late January at Caterpillar in Illinois and here at Santa Barbara in February. We thank Bruel & Kjaer for this web time and the Chicago Chapter of the Institute of Environmental Sciences and Technology for arranging these presentations and for inviting me today to discuss “Measurements and Analysis”. Here in Figure 1, we need to decide. Shall we measure displacement? Or velocity? Or acceleration? What do these words mean? Visualize sitting in your car, engine off. Over time, your trip odometer tells you that you’ve not moved. Your position, your location, your displacement, hasn’t changed, black graph. Over time, your speedometer tells you that your speed, your velocity, remains at zero, green graph. Thus your rate of velocity change, your acceleration, also remains at zero, red graph. An accelerometer would confirm the latter. In Figure 2 we change the situation to unidirectional motion. Now your car is accelerating at oh, let’s say 1/10 g, 1/10 the acceleration that Sir Isaac Newton’s falling apple experienced. An accelerometer would confirm that acceleration, graphed in red. As we consider the passage of time, the area under the acceleration curve increases, as plotted by the rising green velocity graph. Your car’s speedometer confirms this. The area under the velocity curve increases even more rapidly, as plotted by the exponential black displacement graph. Your car’s odometer confirms this. Mathematically, what have we done? 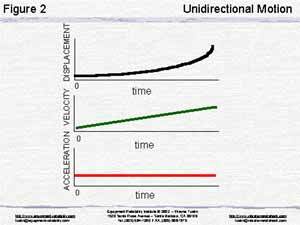 We have integrated acceleration twice. 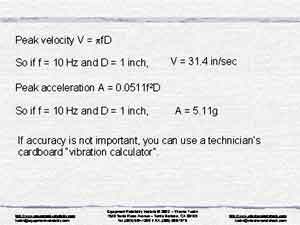 Remember this when you connect an accelerometer to a double integrator, making it possible for you to measure displacement or to control the vibratory displacement of your shaker. 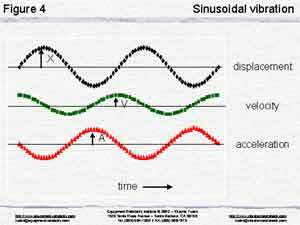 Now let’s discuss classical sinusoidal vibration, Figure 3. Instead of unidirectional motion, we now have a motion that reverses. The time history repeats in a period T of oh, let’s say 0.1 second. We’ll talk about the frequency, f, the reciprocal of T. That is, 10 hertz. 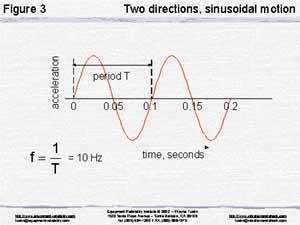 Our red sine wave, low here in Figure 4, can represent that acceleration. The integral, the area under that graph, is plotted in green, representing velocity, also a sine wave but ¼ cycle later in time. The integral, the area under that graph is plotted in black, representing displacement, also a sine wave but another ¼ cycle later in time. Let’s suppose that these graphs represent the 10 cycle per second, the 10 hertz motion of a shaker armature moving up ½ inch and then down ½ inch, 1 inch peak-to-peak displacement. What is the peak velocity? … the unit shown here in Figure 5. Similar units are given by Wilcoxon, Ling, MB, Wyle and other manufacturers. Figure 6 shows the internal construction of a “compression” style accelerometer, attached to some structure you are studying. If your structure drives the base upward, the seismic mass (probably high-density tungsten) resists being accelerated. Its inertial reaction force (Newton taught us that F = MA) further compresses the piezoelectric element, literally squeezing out some electrons, giving us an electrical signal representing your structure’s acceleration. 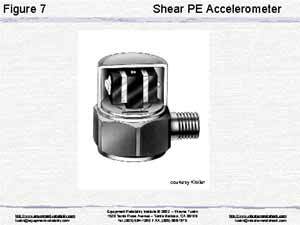 Figure 7 shows the internal construction of a “shear” style accelerometer, attached to some structure you are studying. If your structure drives the base upward, the seismic masses (probably high-density tungsten) resist being accelerated. Their inertial reaction forces shear the piezoelectric elements, literally squeezing out some electrons, giving us an electrical signal representing your structure’s acceleration. We lack time, today, to discuss other accelerometer types: piezoresistive, capacitive, servo and others. 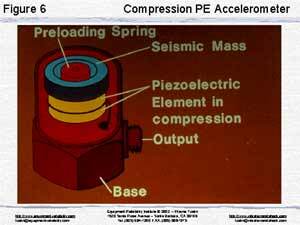 Almost all vibration measurements today utilize accelerometers for sensing. For simultaneous acceleration measurements in three orthogonal directions, you could purchase and use three accelerometers. 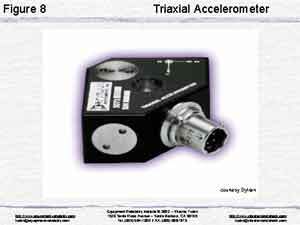 Or you could purchase and use one so-called “tri-axial” accelerometer, as in Figure 8. 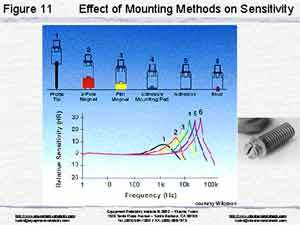 We utilize the broad flat frequency response (Figure 9) of our accelerometers, found at lower frequencies. 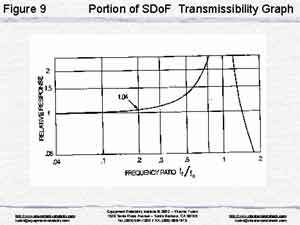 We ask, “What is the highest forcing frequency Ff present?” When testing to say 2,000 Hz, the resultant chattering, buzzing, rubbing, etc. inside our test article can reach say 20,000 Hz. We seek an accelerometer whose natural frequency Fn is 100,000 Hz or higher, so that resonant magnification does not exceed 4%. Figure 10 suggests comparison calibration, determining the sensitivity of an “unknown” accelerometer. It is mounted atop a “known” accelerometer whose sensitivity was previously determined by a standards lab. Here the two accelerometers are being vibrated by a small electrodynamic shaker. Their electrical signals are being compared. How will you attach your accelerometer to a structure you are investigating or testing? Figure 11 shows that best results utilize a manufactured mounting stud similar to that used at the accelerometer factory and at calibration labs. See sketch 6 and graph 6. Other mounting techniques include (see sketches and graphs 5, 4, 3 and 2) adhesive, adhesive mounting pad, flat magnet and 2-pole magnet. Least good: the hand-held probe of sketch 1 and graph 1. Note how seriously the useable frequency range is compromised. 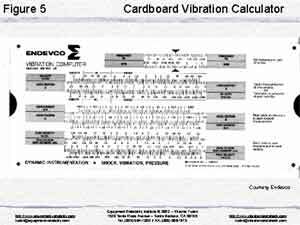 On what instrument will you display vibration quantities? Will you display magnitude on some form of voltmeter? 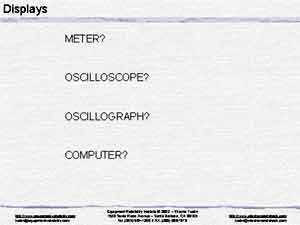 Will you display the “time history” on an oscilloscope or record it on an oscillograph? Or will you perhaps process, store and display on a computer? 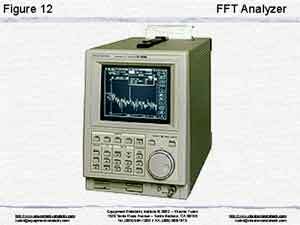 … the mechanical behavior of the “mechanical spectrum analyzer” of Figure 13. 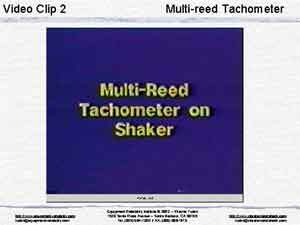 It contains a series of reeds. 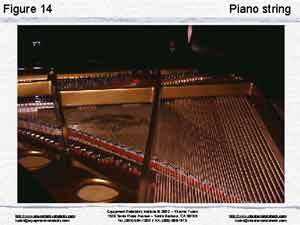 Each is mechanically tuned to respond when vibrated at the cerrtain frequency. Here we see the 1,750RPM (29 Hz) reed responding to shaft unbalance in a motor that is spinning at 1,750 revs per minute (29 revs per second). 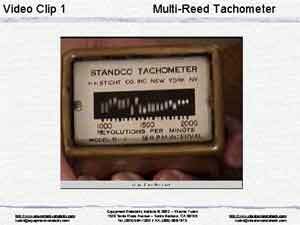 H H Sticht of New York still makes these analyzers, calling them tachometers. Strike the unit with your knuckle. Now all the reeds respond, each quivering at its own natural frequency. 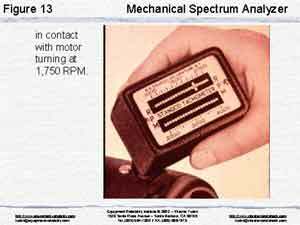 This suggests that mechanical shock (in service or in a test lab) excites all of a product’s resonances. So does random vibration. 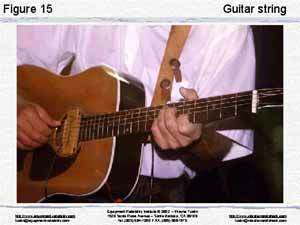 Until this video clip, we have been assuming that vibration is single-frequency-at-a-time. Rarely, in the “real world”, is this true. 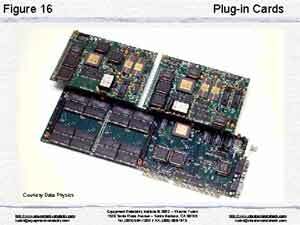 … Figure 16 to convert your PC into a spectrum analyzer. 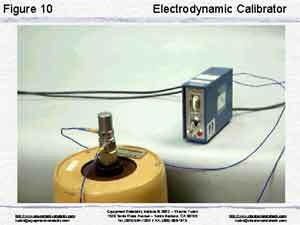 Video clip 2, showing our mechanical spectrum analyzer resting on the vibrating table of a shaker, conveys the idea of a continuous spectrum with all forcing frequencies present, as with the broad spectrum random vibration many of us use for random vibration testing, HALT, ESS and HASS. Here are some upcoming “open” courses which you might attend. Santa Barbara in February is not considered to be punishment! I’m lucky to live there. While you are at this website, please see the details of these courses by clicking here. 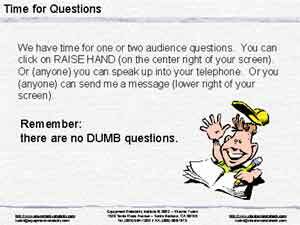 Or consider having us “tailor” training to meet your needs, for presentation at your site, as last month at Redstone Arsenal and at Daimler-Chrysler. Details about CD-ROM training are also shown.